It took 11 days, but here we are again! The first 10 kilometers in Uzbekistan! Never thought a border crossing could be that well organized and challenging. And I knew there are mosquito’s in Uzbekistan; it was a warm welcome indeed! Apparently the border crossing Panjikent, close to Dushanbe, is closed for more than 2 years, and that was not in the Tour d’ Afrique plan. So we had to cross the border more than 300 kilometer up north by bus. We left Dushanbe at 05:45 hours in the morning; 45 minutes later than scheduled. Staff told us that we should arrive at the border at approximately 13:00 hours (7 hour ride) due to the bad road condition, a 3378 meter mountain pass and a 6 kilometer tunnel under construction. We arrived just before 17:00 hours at the border, just over 11 hours! Leaving Tajikistan went actually quickly. Entering Uzbekistan as well: the X-Ray machine didn’t work as it didn’t have any electricity so all riders and their daily and hotel bags were allowed to walk through. Just like that! 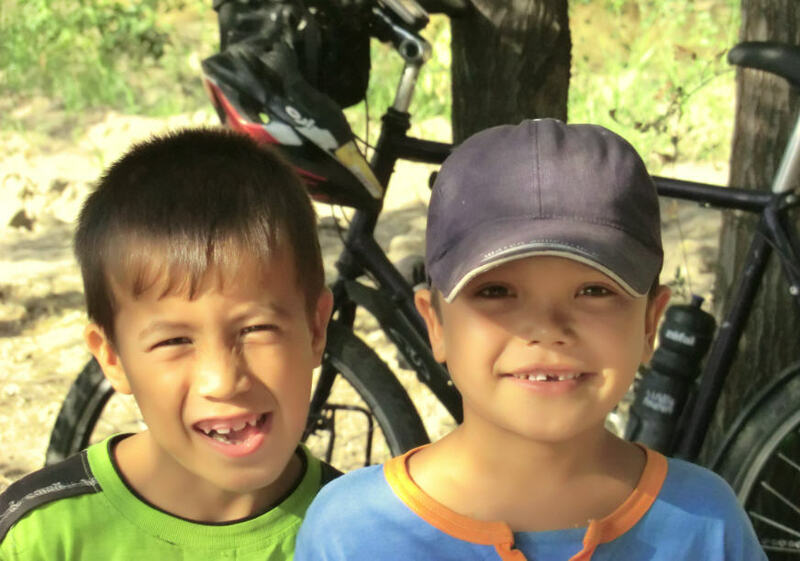 We all waited until staff and equipment came through… nothing happened… After more than one hour we noticed the Uzbek support vehicle leaving so we assumed it went to camp and as we were anxious to ride and local support told us to ride to camp, we happily were back in the saddle. Camp wasn’t at 5 kilometer as told by staff, but at 10 kilometer from the border crossing. And our bags, including tents, were not there! There were however, hundreds of mosquitos! They had a good meal! And since there is malaria in Uzbekistan this was another dangerous situation no one wanted to be in as this could have easily been prevented if organized properly by Tour d’ Afrique. The support vehicle finally arrived after one hour waiting. It turned out that when they wanted to move the equipment through customs, the X-Ray worked again and everything had to go through the machine! And with everything they meant everything: pots, pans, stoves, tables, chairs, peanut butter and even the wind screens for the gas burners! A local family, living next to camp, made us a great dinner late in the evening. Everyone enjoyed that so much that there was no talking, and we went straight to bed afterwards. Anyway, we made it into Uzbekistan! And I cycled the first 10 kilometer after my Khorog experience. The night was surprisingly cold and I had to get into my sleeping back to stay warm. But as always, I slept really well! The next morning, the kids were a bit shy but were proud to hang around. 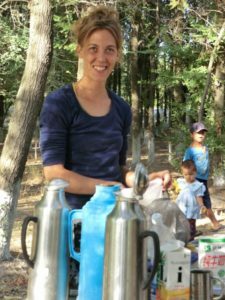 Ingrid made a delicious oatmeal breakfast and I was ready for another bicycling day in Uzbekistan!